Just when you thought the socialist left could not get any lower, they prove you wrong! Tom Perriello, a leading Democrat candidate for Governor and one of Obama’s closest allies, just made news by comparing Trump’s election to the 9/11 attacks. This is beyond the pale! Disgusting! Outrageous! Sign our petition to demand Tom Perriello apologize to victims of the 9/11 attacks for his insane remarks. Uh, ok. Meanwhile, of course, we haven’t seen this outrage by Republicans regarding all the bizarre/crazy/offensive things Trump said about 9/11. See following the tweets for more on that. 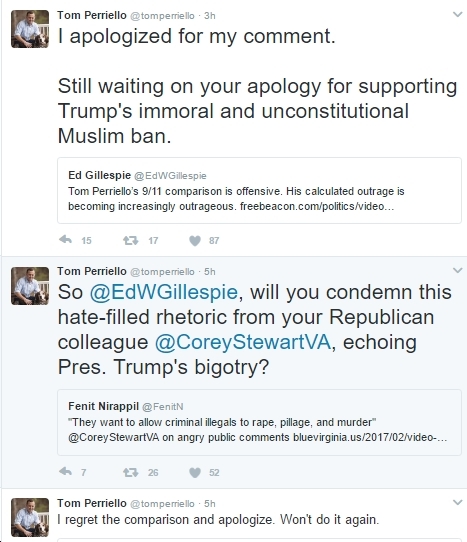 also note that, as Perriello – who apologized almost immediately for his remarks, as he should have – points out, Republicans have certainly not condemned Trump’s “immoral and unconstitutional Muslim ban” — or, I’d add, the many other bigoted, crazy, offensive, etc. things Trump has said/done over the past few years (e.g., pushing “birtherism,” attacking a Hispanic-American judge, getting caught making disgustingly misosynistic remarks, you name it). Finally, if you want a good laugh, check out the whining on the Republican Party of Virginia’s Twitter feed about how the Washington Post hasn’t covered this intensively or critically enough. Regarding Trump’s comments on 9/11, how about his crazy/false claim that “I watched in Jersey City, New Jersey, where thousands and thousands of people were cheering as that building was coming down?” Or how about Trump bragging, just a few hours after the attacks, that “his 71-story building blocks away from the now-collapsed twin towers…’actually was the second-tallest building in downtown Manhattan, and it was actually, before the World Trade Center, was the tallest—and then, when they built the World Trade Center, it became known as the second-tallest. And now it’s the tallest.’” Gack. And then there’s this: “At a Wednesday morning campaign event in Bluffton, SC, Donald Trump takes his relitigation of the Bush administration’s record on 9/11 and Iraq to the next level, seeming to imply that we don’t currently know who ‘really’ committed the 9/11 attacks.” Gack. So…any comment on any of that, Ed Gillespie, Virginia GOP, etc?